The event, hosted by the University’s Chancellor, Lord Swraj Paul, brought Faculty staff together with key people from construction, professional and legal services as well as the health care industry to celebrate the first year of the University working with employers to provide Degree Apprenticeships. As well as the Chartered Manager Degree Apprenticeship, the University also offers Higher and Degree Apprenticeships in Construction Management with pathways for Civil Engineering & Built Environment, Manufacturing Engineering, Product Design & Engineer, Chartered Surveying, Chartered Legal Executive, Digital Technology Solutions, Nursing Associate and Professional and Healthcare Science Practitioner. Ruksana Kavde, Information Officer within Children’s Services at Walsall Council who is one of their employees studying for the Chartered Manager Degree Apprenticeship at the University of Wolverhampton Business School, said: “What I love about the Degree Apprenticeship is that it’s great balance between studying, work and family life. Enhancing my skills will enable me to better my services for my organisation. 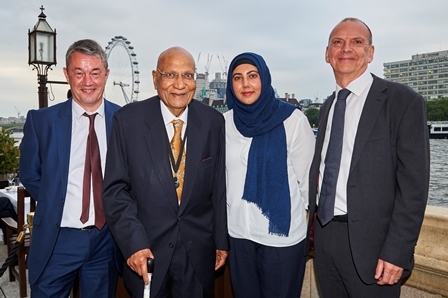 Professor Geoff Layer, Vice-Chancellor at the University of Wolverhampton, said: “The House of Lords celebration event recognised the efforts and commitment of partners and employers who have really embraced our vision of lifelong learning. “The government is committed to providing three million apprenticeships during this parliament – the majority of which will be higher level skills with a requirement that courses meet the skills needs identified within each region. The University also offers a range of professional development courses for individuals and employers. Designed by employers, universities and professional bodies, Degree Apprenticeships deliver high-tech and high level skills and offer an alternative to a traditional degree course. Bringing together university study with paid work, Degree Apprentices spend part of their time at university and part with their employer. For further information about Degree Apprenticeships visit the website or email: apprenticeshiphub@wlv.ac.uk. Picture caption from left to right: Mark Price, Director of Apprenticeships (Business) at the University, Lord Swraj Paul, Ruksana Kavde, Information Officer within Children’s Services at Walsall Council and Professor Geoff Layer, Vice-Chancellor at the University.